Our delicious December issue hits the shops on Friday! 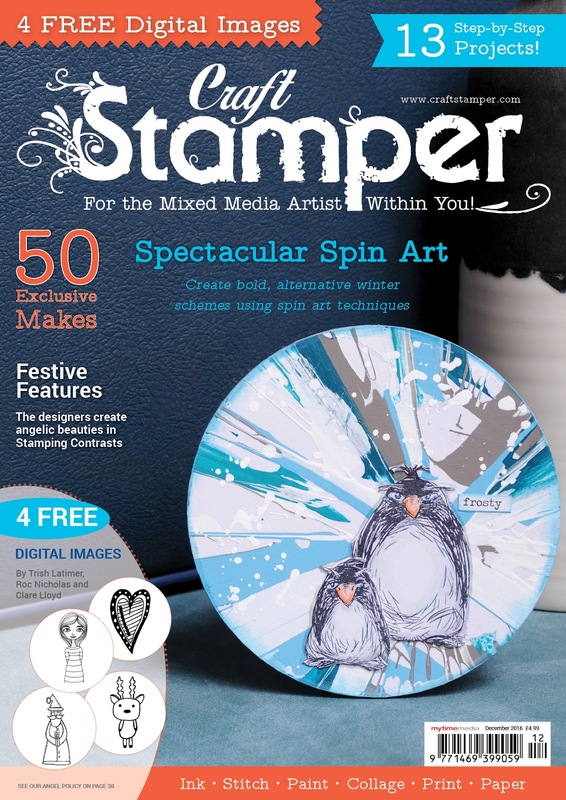 The December issue of Craft Stamper Magazine hits the shops this Friday (2nd)! This issue has a decidedly seasonal feel! Our talented designers have created some gorgeous stamped projects (as usual! ), lots of snow, ice and wintery projects for you to feast your eyes upon. Tracy Evans is sharing the most AMAZING tutorial with us on page 14! She used a salad spinner, of all things, to create the fabulous background for her Wintery Penguin pieces. Such a great effect! For a bit more of a colourful twist on your Christmas cards, why not take inspiration from Florence Langley on page 60? The tutorial Flo has shared with us shows a wonderful layering technique, definitely one to try! and a wonderful girl image by the talented Clare Lloyd. Clare creates her girls in rubber for PaperArtsy, so we are thrilled and honoured she has shared an exclusive digital design with us! All information about the digital images can be found on page 38. We also have an wonderful stencilled project by Gio Zara..
and an inspiring Masterclass featuring PanPastels by Riikka Kovasin in this issue! 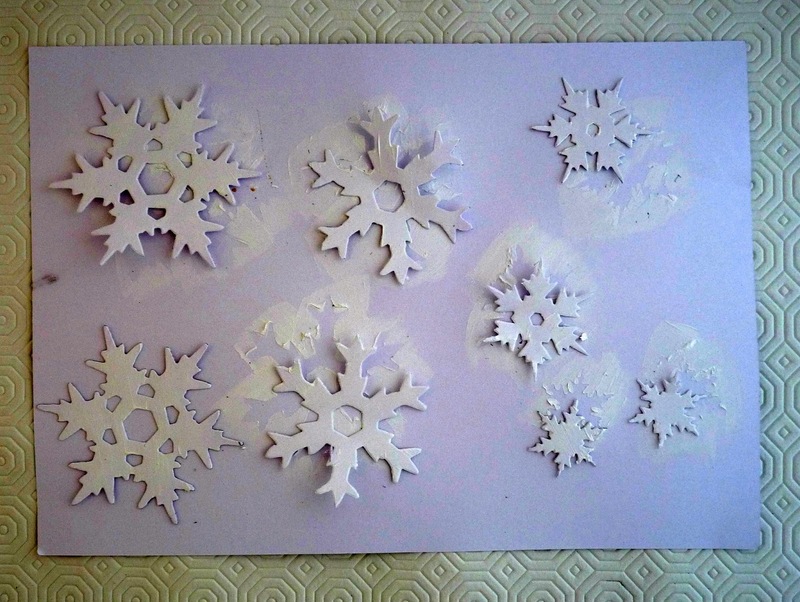 Aren't those snowflakes just gorgeous? 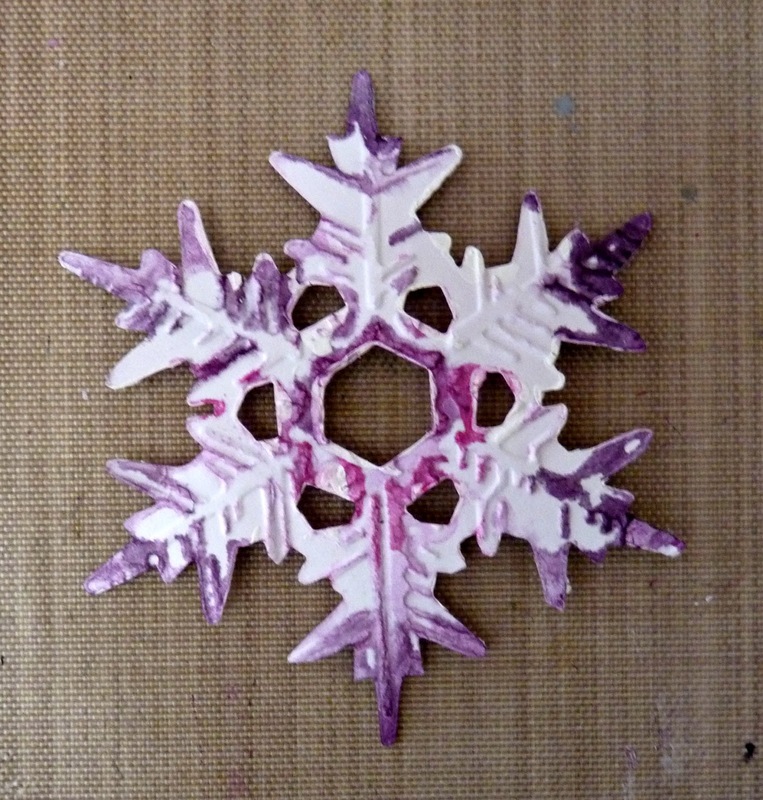 Layered Snowflake and Stacked Snowflake dies. 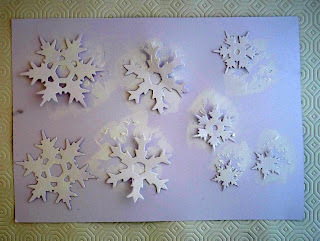 1 Die cut snowflakes from card and seal with gesso. 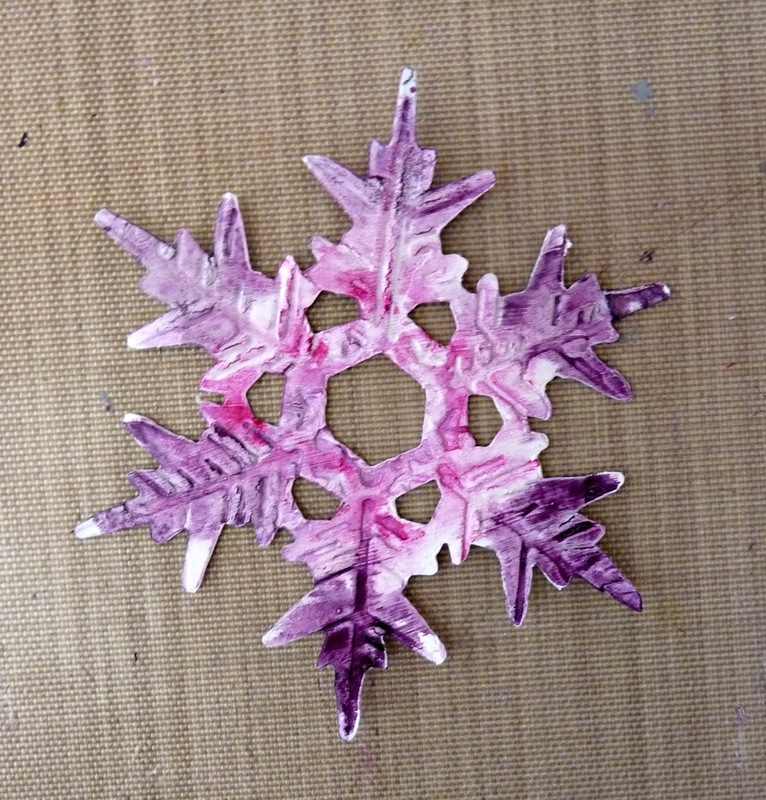 Emboss using the embossing folder that accompanies the Layered Snowflake die. 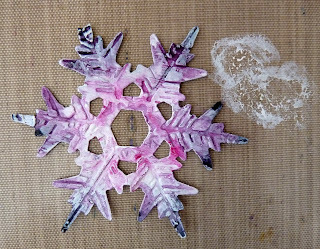 2 Work on each snowflake one at a time, spritz with water and dab on chosen colour of paint, add a second colour whilst still wet and heat dry. 3 Turn your snowflake over, you will see the colours seeping underneath the edges and being soaked up by the non-sealed card. 4 Continue to add layers of water and colours (and mix colours to create various combinations), until you are happy with the results. 5 Add more interest to some by rubbing white paint over it using your finger and keeping very little paint on it. 6 You could also try adding transparent Crackle Glaze or gloss varnish, then white or black antiquing cream and finish with gems given a quick coat of gesso. 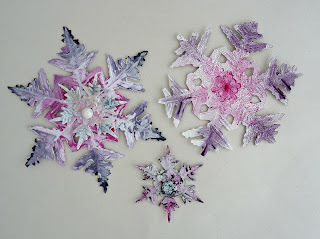 To finish the project: Seal the snowflakes with a coat of ultra matte or gloss varnish, stack some of them together and perhaps adhere some glitter. 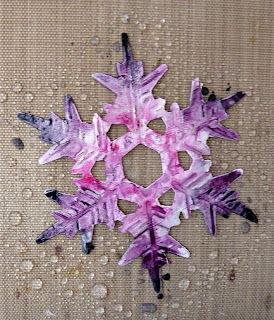 Add them to your Fragile Winter mixed media canvas or make yourself a winter wall hanging like the one pictured above. 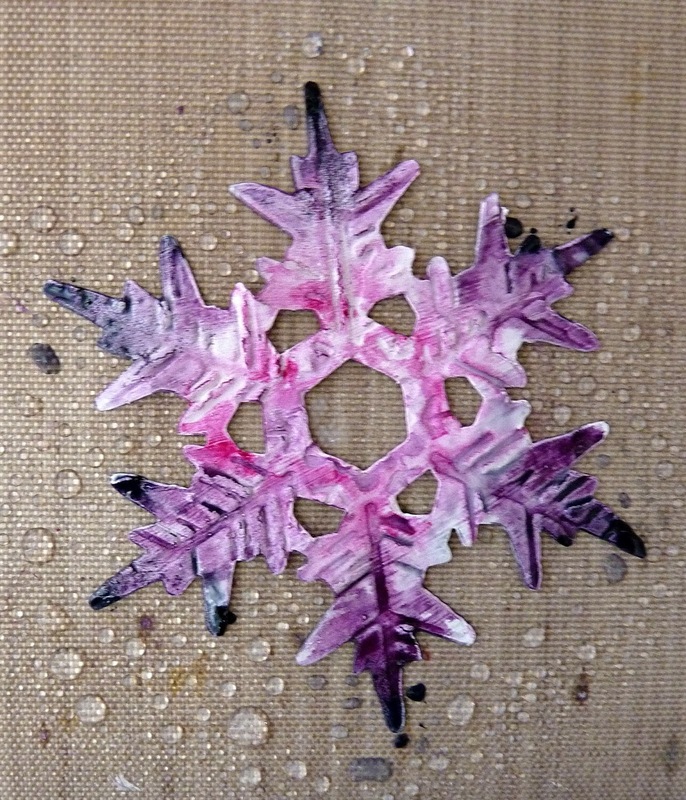 Check out the December issue of Craft Stamper Magazine to see the full tutorial for Brenda's Fragile Winter canvas! This issue will hit the shops on Friday, November 2nd. 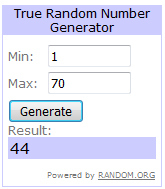 We are so pleased to announce the winners of our October Challenge: Take A Theme: Autumnal Creations! We loved this gorgeous card! The stencilled colours are just perfect for this theme, the leaves are beautiful! Rahmat will win a Guest Designer slot here on the blog, her very own Winners Profile, and of course her amazing art will be featured in it's own 2 page spread in Craft Stamper magazine! Congrats Rahmat! 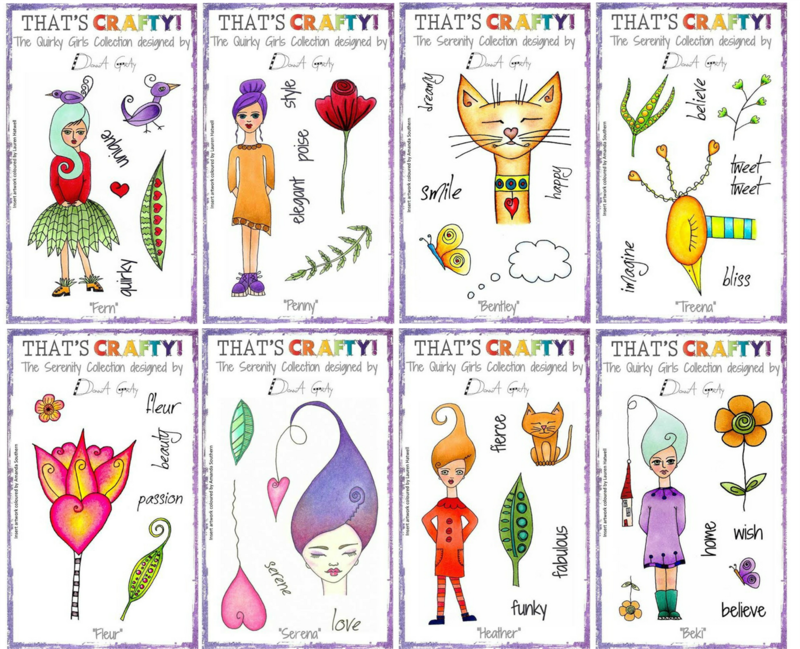 Wonderful stamps, and a wonderful prize! Our November challenge will be launched next Friday, November 4th. 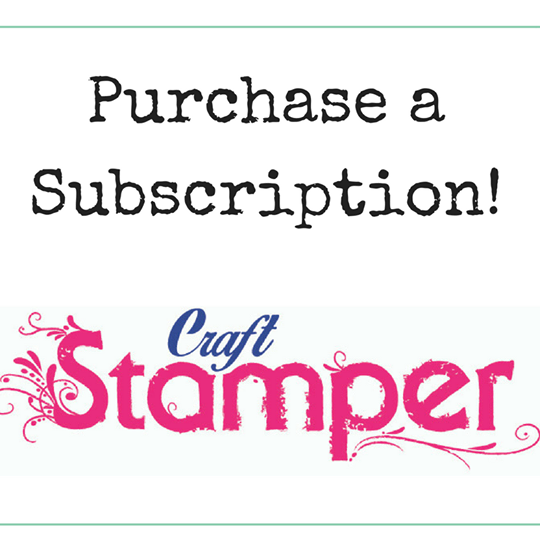 Welcome to the Craft Stamper Throwback Thursday! Every Thursday we showcase a tutorial from a vintage Craft Stamper... sharing wonderful inspiration from one of our back issues. Something new for our recent readers, and a nice reminder for those who have been with us a while! Today, we're sharing a fabulous shaker card by R Maria Sabina, first published in our October 2014 issue. 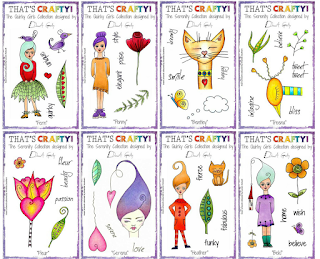 "There are so many fun ways to decorate a card. One of my favourite ways is to add an eye-catching feature. Why not put the the one layer cards aside for a moment and dare to experiment more? You can fold the paper in different ways, add secret pockets or make a shaker card like the one I have created here. Interactive cards can be suitable for everyone, for any occasion. I like to recycle as much as possible, so this project gives me a fantastic new way to reuse a clear plastic bag as the basis for a cute Halloween card. When you’re making yours, be sure to remember to cut your stamped cardstock panel so that it is slightly smaller than the clear bag. This will allow the sequins and beads to move around more freely. Don’t add too many sequins and beads inside the bag. We want this shaker card to shake, not to get stuck. For the same reason, always use 3D foam adhesive to mount the frame over the bag, otherwise it will get squashed and the beads won’t move around"
Step One: Stamp the main scene onto white cardstock. Colour in the background using the Distress Inks and a sponge or ink blending tool. Keep the edges darker and the centre lighter. Step Two: Flick drops of water over the cardstock at random, allow the drops to sit for a few seconds on the ink, then blot them with a piece of kitchen roll. Step Three: Die-cut a few stars from white card. Colour these with Cantaloupe and Tangelo inks as for the main card image. Step Four: Insert the stamped and coloured card inside the clear bag. Add a few sequins, the die-cut stars and some beads inside the bag too and seal it well. Step Five: Cut a panel of brown card slightly larger than the bag – allow approximately 1cm extra along each edge. Die-cut an oval from the centre, then emboss the frame with the Woodgrain folder. Cut and fold a black card base the same size as the frame. Add adhesive to the back of the bag and mount it onto the front of the card base. Step Six: Place strips of 3D adhesive foam along each edge around the clear bag. Mount the embossed frame over the clear bag. The sequins and die cuts will move freely inside the bag, giving great movement! We love this, it definitely has that Halloween feel going on! Thank you for the inspirarion R Maria! 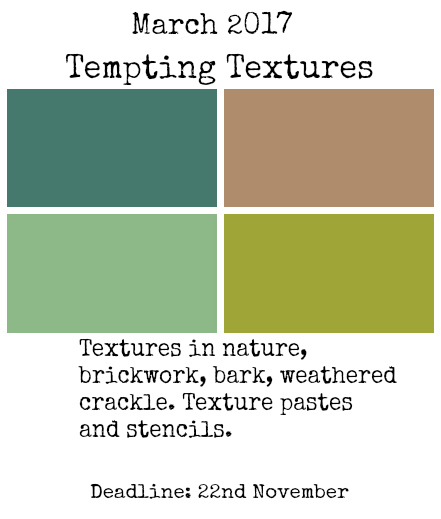 Colours: Fern Green, Bark, Sage, Leaf Green. It's Thursday... time for a little Throwback! 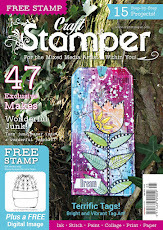 Every Thursday we will be sharing a wonderful project from a past issue of Craft Stamper Magazine.... a full step by step tutorial for you to feast your eyes upon! As a new project for our newer readers, or a reminder for those who have been with us a while... it's sure to inspire! 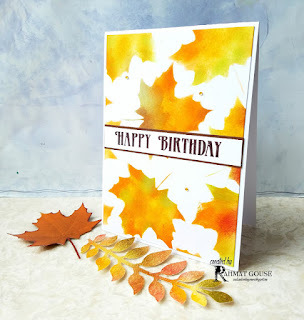 Today we are going back to August 2014, and a brilliant tutorial from Kay Carley. It took me quite a while of playing around to get the card to match what I had in my head! I knew that I wanted to use these wonderful stamps by Lavinia with Distress inkpads but I wanted to introduce ‘prettiness and lightness’ into the equation! 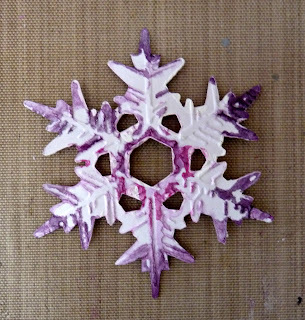 In the end I managed to achieve this by stamping with white pigment ink and embossing with Crystal embossing powder. I also took into account the type of ink that I was using, as well as the type of stamps I was working with. Lavinia Stamps are clear polymer, and therefore if you use a dye based inkpad on them you will find that the ink can ‘bead up’ on the surface of the stamp. This will not provide a nice crisp image when stamping it out. However (most of the time) I didn’t want a nice crystal clear image, so I was able to use this to create subtle variations within my stamping! Whenever I wanted a clear defined image I stamped with Versafine (which is an oil based pigment inkpad which provides crisp imagery) and when I wanted a softer blurred image I stamped with a Distress inkpad (which is dye based). You’ll notice that my ‘focal imagery’ has either been stamped with Versafine/Brilliance or stamped and embossed – these catch your eye first. The supporting imagery has all been stamped with Distress inkpads and although there is a lot of imagery on the cards, nothing is ‘fighting’ with each other! This is due to adjusting the intensity of the imagery with the different types of inkpads and with the use of secondary stamping. Step One: Sponge Antique Linen onto a blank piece of smooth white card applying the ink to achieve lighter and darker patches then apply Victorian Velvet around the edges of the panel. Step Two: Tear a piece of scrap paper to create some hills/mountains shapes. Place roughly half way up the panel and sponge Antique Linen and Victorian Velvet. Move the mask and repeat as desired. Step Three: Tear a curved edge from scrap paper and use this mask to create some foreground by sponging with Antique Linen, Victorian Velvet and a little of Frayed Burlap. Remove the mask. Wet your fingers by dipping them into water or by spraying them with water and flick your fingers over the panel to create water droplets. Allow the droplets to dry. Step Five: Using Antique Linen, stamp Wild Flowers 2 along the base of the panel then take the tall Wild Flower stamp and Victorian Velvet inkpad and stamp three of these images varying the height. Step Six: Using Frayed Burlap, stamp Field Grass around the base of the panel angling the stamp in different directions each time you stamp it. Then using Seedless Preserves stamp Bluebells – stamping them twice before re-inking. Step Seven: Stamp Mia fairly centrally onto the panel using the Toffee inkpad: angling the stamp so that she is flying rather than standing. Step Eight: Stamp Leaf Trail several times into the top left corner using Antique Linen and repeat with Frayed Burlap. Stamp flowers amongst the ‘branches’ using Victorian Velvet and Seedless Preserves. Dry all stamped imagery using a heat gun. Step Nine: Stamp and emboss Field Grass around the base of the panel and Leaf Trail to the top left corner and right-hand side using the white pigment inkpad and Crystal embossing powder. Step Eleven: Darken up the edges of the panel by sponging Victorian Velvet around all the sides then flick the panel again with water to soften the edges being careful not to apply too much water to the stamped dye based imagery. Step Twelve: Tap a Versamark inkpad around all the edges of the panel and emboss with Crystal embossing powder. Stick the panel to a wider white tall card blank and edge the long sides with a black marker. To finish the card apply Crystal glitter glue to Mia’s wings then apply dots of this and Liquid Pearls falling from her hands and add Liquid Pearls to some of the flower centres. So full of detail.... simply stunning! See you next week for more Throwback Thursday inspiration!